HomePhoria Presents Coldharbour Night this Friday! Phoria Presents Coldharbour Night this Friday! Phoria has one more bash for y’all trance fans before we take a break till July 10th with Gabriel & Dresden. 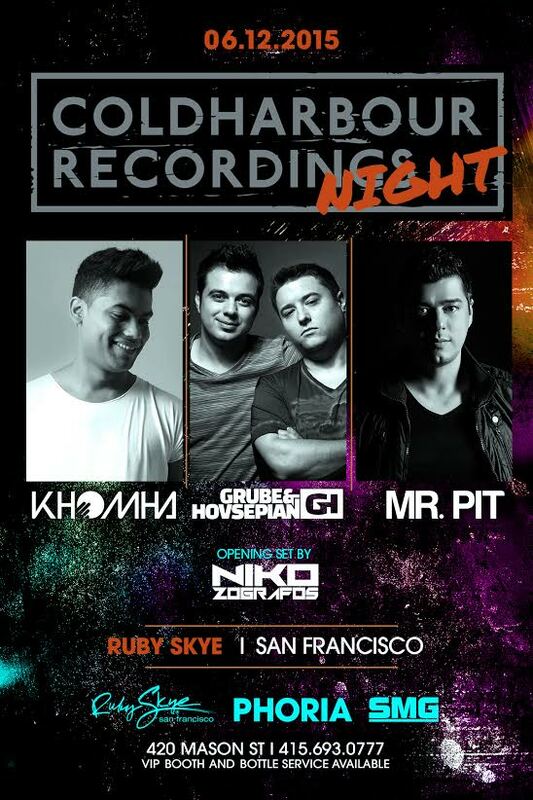 This Friday, Coldharbour Recordings will conquer the clubbing scene in San Francisco as Phoria presents Coldharbour Night with KhoMha, Grube & Hovsepian and Mr. Pit with Niko Zografos opening and closing the event. For those of you who don’t know, Coldharbour Recordings is a record label ran by “yours truly” Markus Schulz. My feelings of admiration for Schulz aside, Coldharbour is one of those truly underrated trance labels as it houses DJs that have the abilities to explore different genres of trance that isn’t limited big room and uplifting. So let me introduce you to some of them. Mr. Pit was one of the first DJs I had the pleasure of experiencing when I first entered the dance scene in SF. His hit track “Shana” echoed everywhere during my early dance days in 2008. But this Romanian producer has been “discovering music production since 1996,” according to his bio. He even released tracks under his real name, Adrian, before he became known as Mr. Pit. His path as a DJ didn’t stop there. Coming off his hot Coldharbour hit, “Exposure”, Mr. Pit has recently been taking down nightclubs with a progressive trance storm. In his recent sets, you can hear the Coldharbour influences that drives his sets as his sound weaves in-and-out of the limitations of trance and progressive. This man will be sure to keep your head bobbing Friday night as you dance away. Tim Grube and Mike Hovsepian are the two heads of the dragon Grube & Hovsepian. The two Miami based DJs found each other from across the nation during their solo-careers in 2008 to become a force to be reckoned with in the trance scene. Two heads are better than one right? It wasn’t long until the two found their sound as they teamed up with Elevation to produce the hit “City of Angels”. That track showed the two’s ability to produce a tune that is not only epic but simultaneously deep. Their producing skills didn’t stop there. The two were able to remix pop hits like “Lights” and “One More Minute” that kept the originality of the songs but were also appeasing to trance fans across the world. It wasn’t long after that this double headed dragon started to drop fiery tracks like “Venom” and “Trickster”, which have been supported by Mr. Coldharbour himself in numerous shows. Schulz even praised the two as he said that “they have become the most exciting duo to come along in the last 3 years.” Well, you heard it from the man in charge, check them out! If there is one thing to be said about Colombia, it’s that they know how to make you move and groove as you dance like no one is watching. And KohMha does not fall short from that expectation. This man may be 23 years old, but he is already a star as he is supported by legends like Armin van Buuren, Ferry Corsten and of course Markus Schulz. Schulz even hand-picked him as Coldharbour’s first artist of the year in 2011. It’s hard to describe and pigeonhole his style into a genre. His tracks such as “Hydra” and “Cyclone” are raw and energetic that makes you just wanna jump up and down in an endless PARTY! KhoMha really flexes his production muscles with his mash-ups. For example, a perfectly combined mash-up of his was with his hit “Asylum” and “Mr. Brightside”. When he wants you to dance, he will spin his style of progressive-tech-trance. But when he wants you to feel the beats and enjoy the moment, he will play techno influenced tracks like “Elektrikute”. You cannot predict what he will play this Friday, you just have to open up your mind and embrace the “KhoMha style” of music as it takes you for a thrilling ride. No wonder his victims of the dance floor have said that they feel “KhoMhatized” after experiencing his exhibition of music. Ruby Skye will be his world in two days as you play his musically charged game. So get ready for this one because just like his country, it’s gonna be HOT!!! Friday is going to be an EPIC night folks, so be sure to join us. Being that this is my favorite trance record label, I already know that I’m gonna have a hoot! I’m excited and I know from KhoMha’s recent post that he is too! ← Coldharbour Night Meet & Greet plus FREE Guestlist this Friday!